At 2,571 metres altitude, this ideal starting point for various activities offers a wonderful view of the Matterhorn. Nestling in the mountains around Zermatt, the Blauherd is a perfect location to get a good look at the impressive Alpine world. Just taking a restful break – or rather keen on action? Guests can take mountain cars to race down the gravel track towards Sunnegga. Attention animal lovers: On the marmot trail (theme trail) from Blauherd past Lake Stellisee to Sunnegga, it is easy to spot one of the many “Murmeli” (Swiss German for marmot) that live there in their borrows and on the Alpine meadows. Once the marmots withdraw to hibernate, the Blauherd turns into an adventure paradise for skiers and snow enthusiasts. 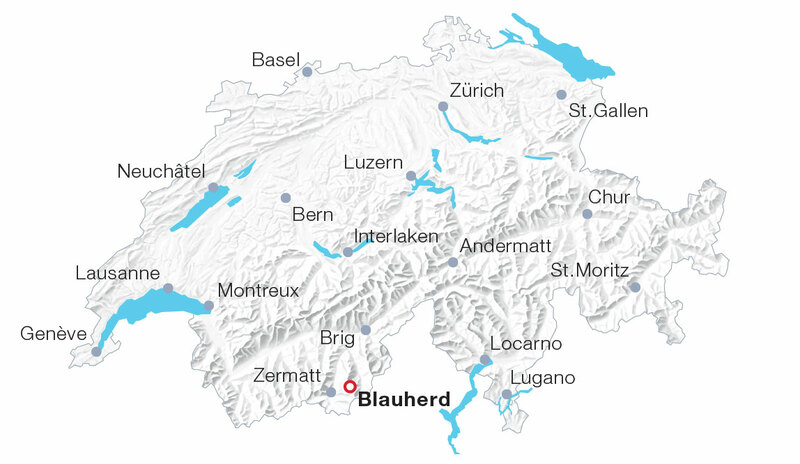 It merely takes 15 minutes to reach the Blauherd from Zermatt.